Kick off Founder’s Week with an eventful breakfast in the Black & Gold Room. Breakfast will begin at 8:00 a.m. Tickets can be purchased from the Office of Advancement for $12. All tickets must be purchased in advance. Join the Grambling University National Alumni Association (GUNAA) for a panel discussion on the road to college success. This event will take place in the Nursing Building Auditorium from 3:30 p.m. – 5:00 p.m.
Don’t miss the Founder’s Day Convocation with guest speaker Attorney Thomas N. Todd. Join us at 11:00 a.m. as we inform and commemorate Grambling State University in observance of the 117th Anniversary of Founder’s Day. You won’t want to miss a musical selection by The World Famed Grambling State University Band. Come out and help salute former President Joseph B. Johnson at 12:00 p.m. at the Legends Walk of Fame. Refreshments will be served. Founder’s week will also help students with the cost of education. Check out these scholarship opportunities. The Office of Advancement in conjunction with the Eddie G. Robinson Museum presents the “What is the importance of Founders Day” essay contest. Essays must be 250-300 words typed, APA format. This scholarship is open only to 1st and 2nd-semester freshmen. The deadline for this application is September 24, 2018. Only First 50 Essays will be considered. Applications can be picked up from Freshman Year Experience professors. 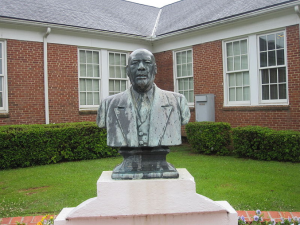 The Eddie G. Robinson Museum and the History Department will be offering another scholarship to the student that creates the best brochure for the Eddie G. Robinson Museum based on purpose and historical information about Eddie G. Robinson. This scholarship is open to all classifications but is exclusive to students currently enrolled in a history class. Only First 50 Brochures will be considered. How are you planning to celebrate a Founder’s Week? Share your events and photos with us at mediarelations@gram.edu.